Point Pleasant senior Brenna Dotson (3) leaps for a spike attempt during Game 3 of Wednesday night’s Class AA Region IV, Section 1 volleyball match against Winfield in Point Pleasant, W.Va.
Point Pleasant’s Lanea Cochran (11) and Tristan Wilson (19) both go for a block attempt during Game 2 of Wednesday night’s Class AA Region IV, Section 1 volleyball match against Winfield in Point Pleasant, W.Va.
POINT PLEASANT, W.Va. — The Lady Knights took their best shots at the Lady Generals, then ran out of ammunition when the Lady Pioneers came rolling through. 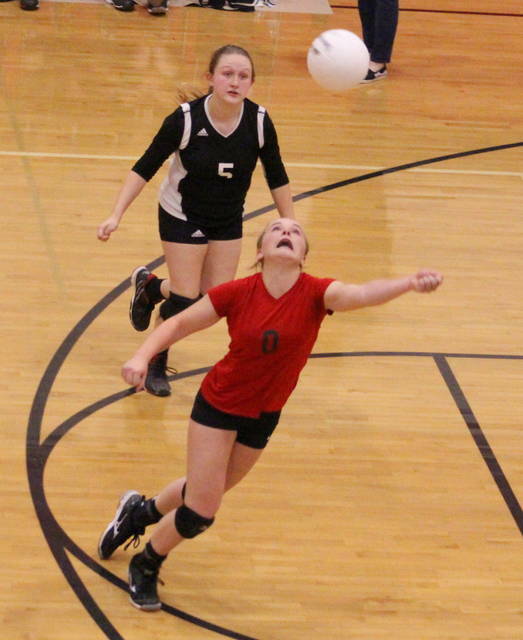 The Point Pleasant volleyball team had its historic 2017 campaign come to a heartbreaking end on Wednesday night during a pair of setbacks to Winfield and Wayne in the Class AA Region IV, Section 1 tournament held at Point Pleasant High School in Mason County. The host Lady Knights (19-5) entered the evening facing Winfield in the winner’s bracket final, with those same Lady Generals handing Point two of its three regular season losses this fall. A win would not only have meant redemption, but also the program’s first 20-win campaign. The Green and White, however, survived 29 ties and 17 lead changes and built a 2-0 match lead before holding on for a 25-18, 25-21, 25-27, 25-20 victory. The Lady Knights then dropped into the loser’s bracket final of the double-elimination tournament, where Wayne was waiting for the Red and Black. The Lady Pioneers — who defeated Nitro in straight games earlier Wednesday to reach the loser’s bracket final — also survived 23 ties and 20 lead changes en route to a 25-17, 25-21, 25-23 victory while earning a regional berth a date with Winfield for the sectional title. Point Pleasant held leads of at least three points in all but the first game of the night and also dropped both matches by 14 total points apiece. The difference in either of the final outcomes wasn’t considerable, but enough to keep the Lady Knights from advancing to a second consecutive regional appearance. Following the difficult double-whammy evening, PPHS coach Marla Cottrill was disappointed to see such a great season come to an end — particularly in knowing that her troops weren’t at their absolute best when it was most needed. “It’s the best season that Point Pleasant has ever had record-wise, so it’s hard to be disappointed about what we were able to accomplish this year,” Cottrill said. “At the same time, the Winfield loss took a lot out of us and we just weren’t close to the same team against Wayne. We just never matched the intensity we had against Winfield when we played Wayne, and they made us pay for it. There were eight ties and six lead changes in the opening game against the Lady Generals, though PPHS never led by more than two points. With the Lady Knights clinging to an 11-10 edge, Winfield scored 10 of the next 11 points for its largest lead of the night at 20-12. Both teams traded points the rest of the way as WHS took a 1-0 match lead with the seven-point decision. Neither squad led by more than five points in Game 2, which featured five ties and three lead changes. 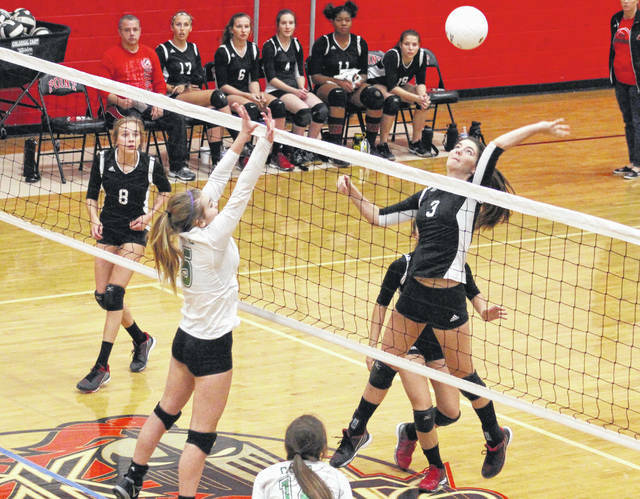 Winfield broke away from a 20-all tie with 5-of-6 points and secured a 2-0 match cushion in the process. Winfield led 1-0 in Game 3, but the guests never led from that point on — despite seven ties throughout the match. Point Pleasant took its biggest lead at 15-10, but WHS rallied to tie things up at 23-, 24- and 25-all. The Lady Knights claimed the final two points and cut the match deficit down to 2-1. There were another nine ties and six lead changes in the finale, with Point Pleasant securing its biggest lead of Game 4 at 16-12. Winfield reeled off seven consecutive points for a 19-16 cushion and ultimately scored six of the final 10 points to wrap up the 3-1 triumph. 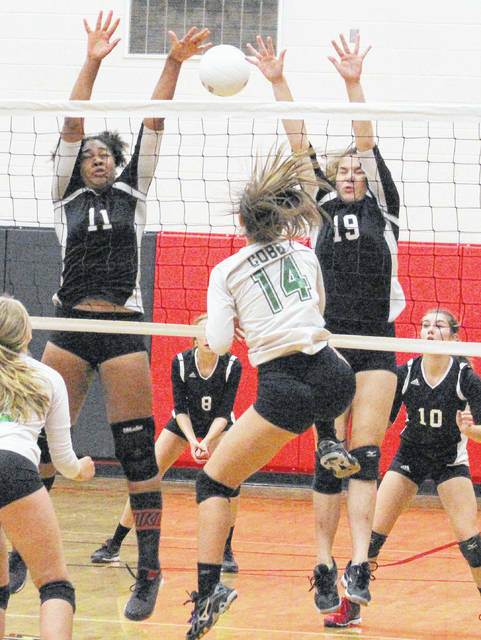 The Lady Knights recorded 34 kills and 34 blocks as a team against the Lady Generals, with Lanea Cochran leading the way with 15 kills and a dozen blocks. Brenna Dotson was next with nine kills and 12 blocks, while Olivia Dotson also chipped in six kills and six blocks. Tristan Wilson was next with two kills and four blocks, while Gracie Cottrill and Madison Hatfield also had a kill apiece. Mackenzie Freeman led the hosts with 14 service points, followed by Hatfield with eight points and Brenna Dotson with five points. Peyton Jordan was next with four points, while Cottrill and Olivia Dotson contributed three points apiece. In the loser’s bracket final against Wayne, PPHS stormed out to an early 3-0 lead before the Lady Pioneers answered with five consecutive points and never trailed again in Game 1. WHS led by as much as 18-9 and 19-10 before cruising to an eight-point decision in the opener. There were six ties and seven lead changes in Game 2, and neither squad led by more than six points. Tied at 15-all, Wayne reeled off eight of the next 10 points for a 23-17 edge — then held on for a four-point win and a 2-0 match cushion. The finale featured 16 ties and 11 lead changes, and neither team led by more than three points throughout. Point’s biggest lead came at 23-21, but Wayne scored the final four points to complete the straight-game decision. 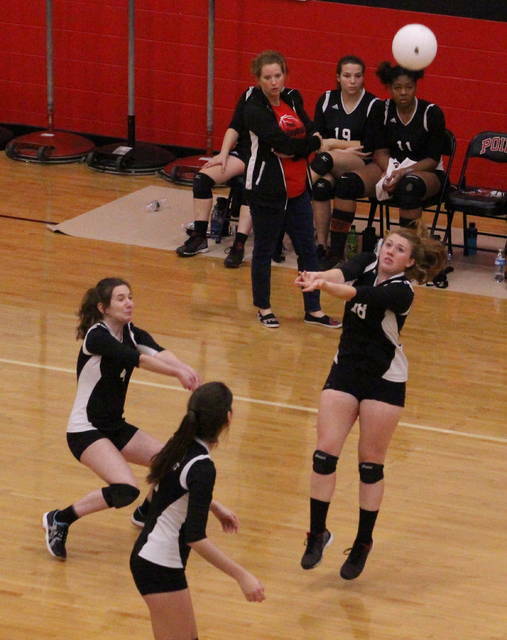 The Lady Knights and Lady Pioneers battled through 23 ties and 20 lead changes over the course of the match, with Point Pleasant posting 21 kills and 10 blocks in the setback. Brenna Dotson led the hosts with nine kills, followed by Cochran with eight kills and five blocks. Wilson and Olivia Dotson also added two kills apiece. Olivia Dotson chipped in two blocks, with Cottrill, Wilson and Brenna Dotson also providing a block apiece. Olivia Dotson led the service attack with eight points, followed by Freeman with five points. Jordan and Brenna Dotson were next with four points apiece, while Cottrill and Hatfield respectively added three and two points. It was the final volleyball match for Gracie Cottrill, Brenna Dotson and Mackenzie Freeman in the Red and Black, something that was hard for Coach Cottrill to see come to fruition. The third-year mentor, however, wanted those upperclassmen to remember how far they’d come … and how much better the future will be because of their contributions. “This group of seniors have been committed to this sport since junior high. They’ve gone from a non-winning program to a winning program during their time with us, and they’ve played an even larger role in getting this program where it is right now,” Cottrill said. “Things are on the upswing here at Point Pleasant. These seniors can take a lot of pride in what they’ve accomplished … and what we can now accomplish as a program moving forward.